This feature has caused a bunch of folks some troubles, as it is secretly hidden! I have made a request into DicksTSHQ to see if they can make the option more visible at the checkout window. But for now, follow the instructions below and view the screen shot to the left to help your find the pay by check option feature. 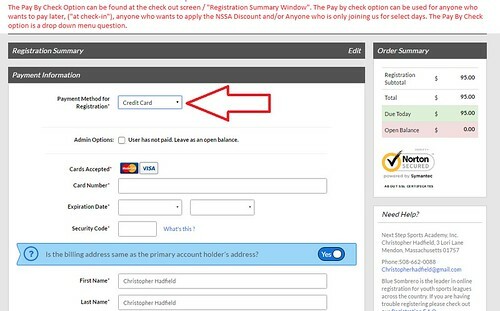 STEP 2: Change the payment method option from Credit Card to Check at the registration summary window. STEP 3: Complete the process. CC information will not be required. See image below on where to locate this feature.